When you’re away from home, the place names that matter to you take on huge emotional significance. 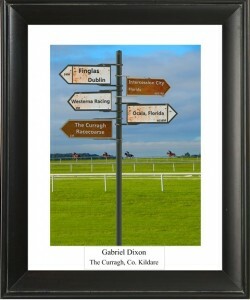 With the Signs from Ireland personalized signpost picture, you can transport someone you love to the places that mean everything to him or her without having to buy a plane ticket. Who is this gift suitable for? Maybe it’s someone who was born in Ireland and now lives far away, or someone with Irish parents or grandparents. Perhaps you or someone you know lived in Ireland for a time and you would like a memento to remind you (or your friend) of all the places that meant something to you. Perhaps you met the love of your life in Ireland. Wouldn’t it be really special to record the places that are significant for the two of you? It’s the perfect keepsake or souvenir from a memorable trip. Think of it this way: a photo or painting can only ever show one place, whereas a Signs From Ireland personalised signpost picture conjures up half a dozen significant places all at once. The whole thing is beautifully framed and sent to wherever that someone is. Problem solved. See how easy it is with the how-to guide on this page, or start making your Signs From Ireland signpost picture right away by clicking here.